T: Dammit, why are you turning without a signal light? M: I think they are stopping for a goose. T: I want to honk, but I can't because that car will think I'm honking at them. You lucky bird! You're a lucky bird because I can't honk at you. BUT I WOULD! T: "Shooter opened fire at a sports bar... But he forgot he was in Texas.." That probably backfired. M: If you don't follow the rules, you die! 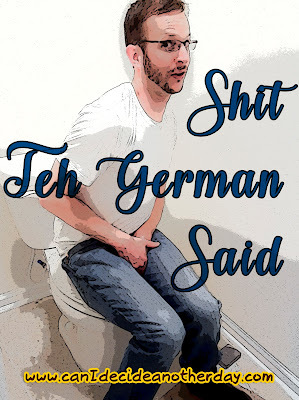 T: That's something a German would say. Teh German's belly growled as we sat down to eat dinner. T: Oh, that Phil Humpfy. I showed Teh German a photo of one of my senior pics with some obviously 90s chunky/platform shoes and continue showing him other photos of me when I was younger. T: I'm marrying that one. I pull up a photo of me in Target wearing a pizza costume. M: Yeah, but you're also marrying this one too. T: You don't know what scam you have! M: You can do it, babe. T: I know I can. I just don't want to. T: Oh bathrobes! I need a bathrobe! I used to love bathrobes as a kid!